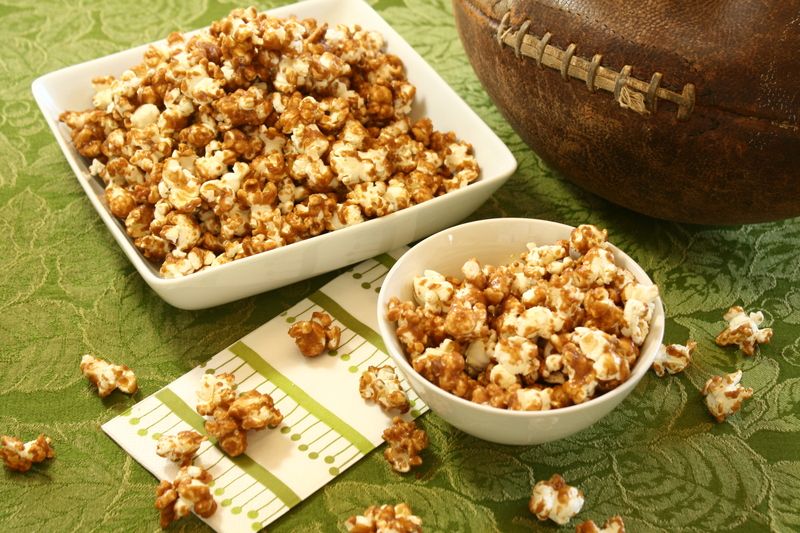 It seems obligatory that today’s post should be about Super Bowl snacks. Football was a big thing in our family when I was growing up. We were big football fans – Minnesota Gophers and Minnesota Vikings. We never missed watching those games on tv and after the game, we headed out to the yard to play our own brand of football. I could throw a pretty good spiral – still can! It was something I enjoyed showing off to the neighbor kids when we were out playing football with our own kids. 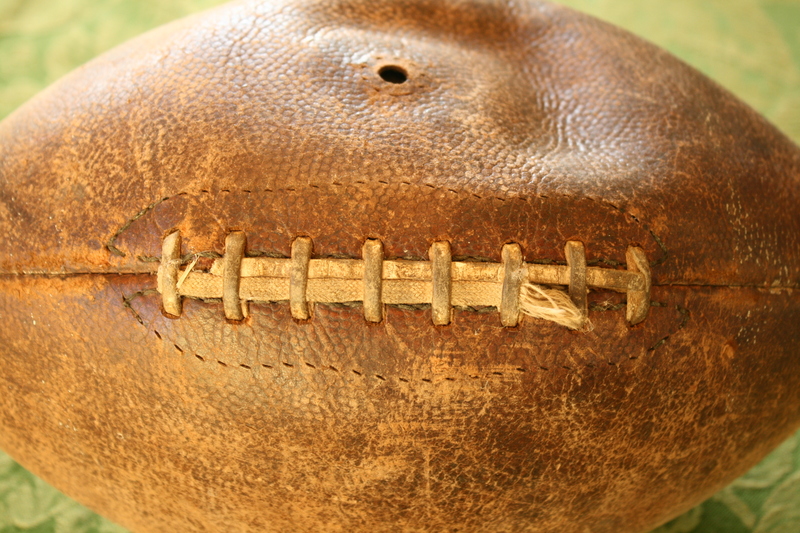 This football was one that my dad had when he was young. I can’t believe we still have it. It was the one we played with out in the yard. 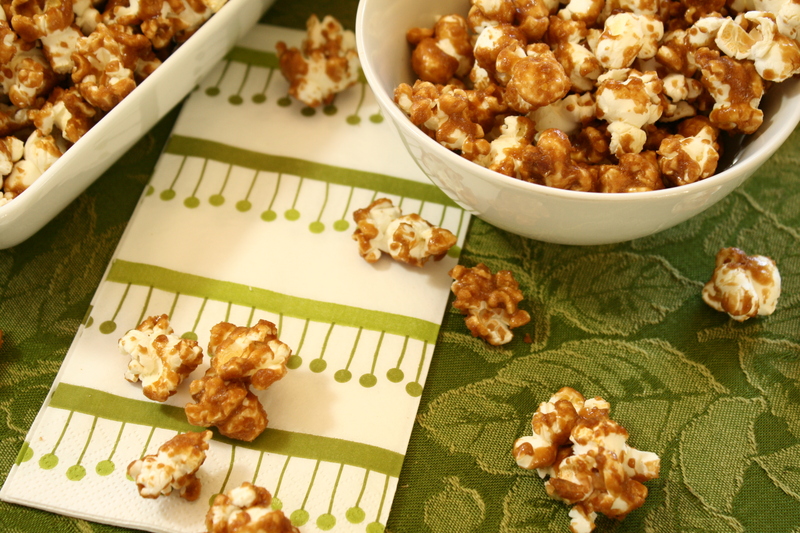 Today’s recipe for Caramel Corn is one that I’ve been making since I was in high school. It came from a family friend and it’s become a Sunday afternoon tradition with our family. My son is a musician and he’s not big into football – this recipe might be his favorite thing about it (he’s even made it himself). We made it almost every fall Sunday when he was in high school and when he went to college, I sent a lot of it to him. It’s pretty easy to make and deadly to have around – it doesn’t last long! This is a big batch and as it says on the recipe card, I usually make a half batch – that’s what seems to fit well in my pans. 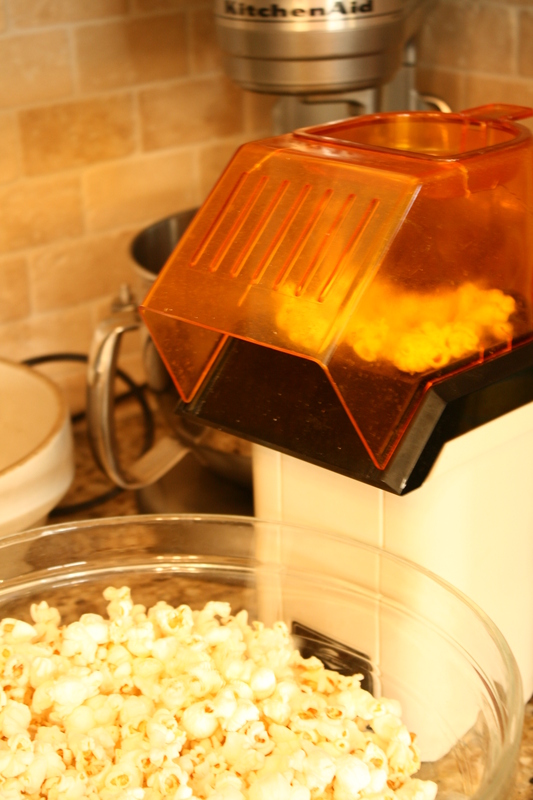 Stir into 5 quarts of popped corn well. Put into 250 degree oven for 1 hour. Can be kept in tight container for several weeks if well hidden – and she ain’t kiddin’!!!! This is my trusty West Bend air popper that I took to college in 1979!! It just keeps on poppin’! The syrup looks a bit dark because we used dark brown sugar. 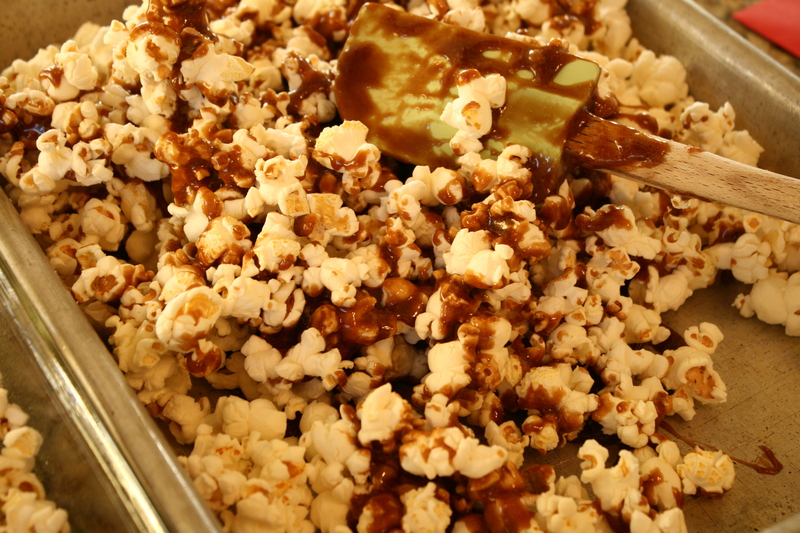 I put the popped corn into two 9″ x 13″ cake pans – sprayed with non-stick spray – so it’s easier to stir. This is why I make a half batch – I don’t know how you would get a whole batch into a container that you could easily stir. 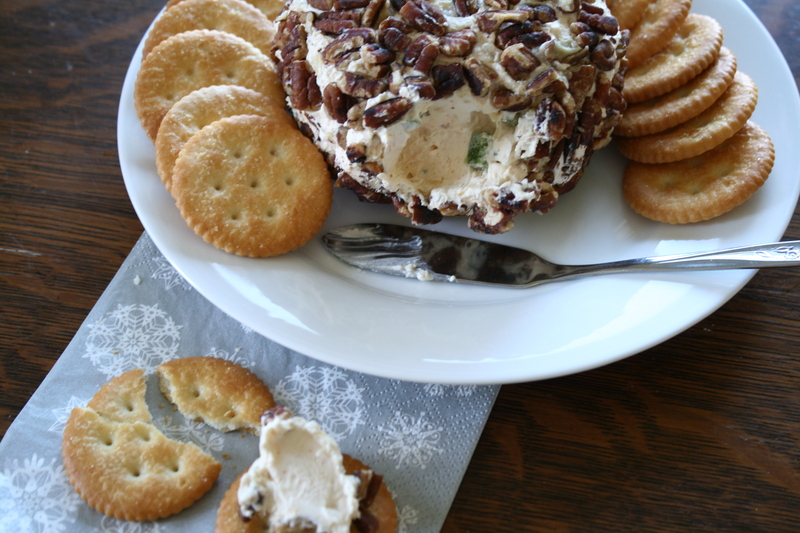 It comes out of the oven good and crisp – just like the store-bought kind! This is one of my family’s favorite treats. Have a great weekend, everybody and enjoy the game! I love winter, but this cold weather is getting even me down. 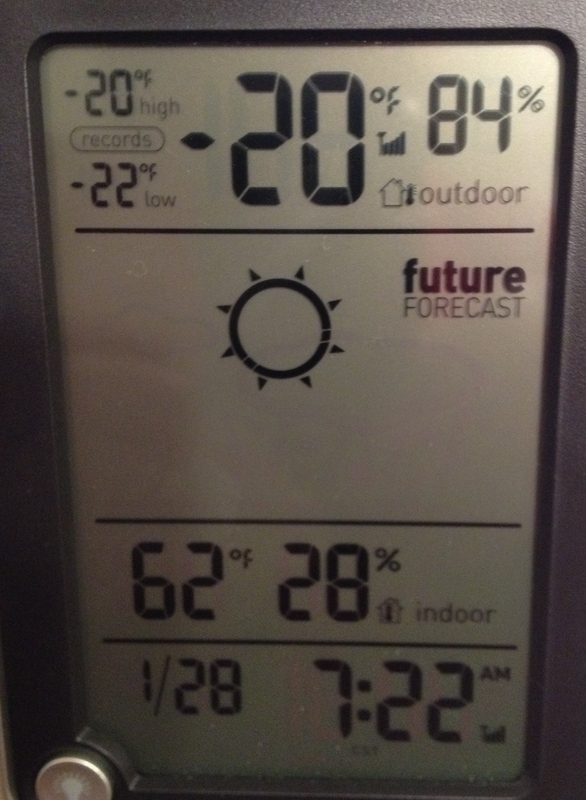 This is what our thermometer looks like lately. It’s time to make a batch of something with ingredients I have around the house and something that’s just for me! I have need of hot beverages. And something to dunk in them. 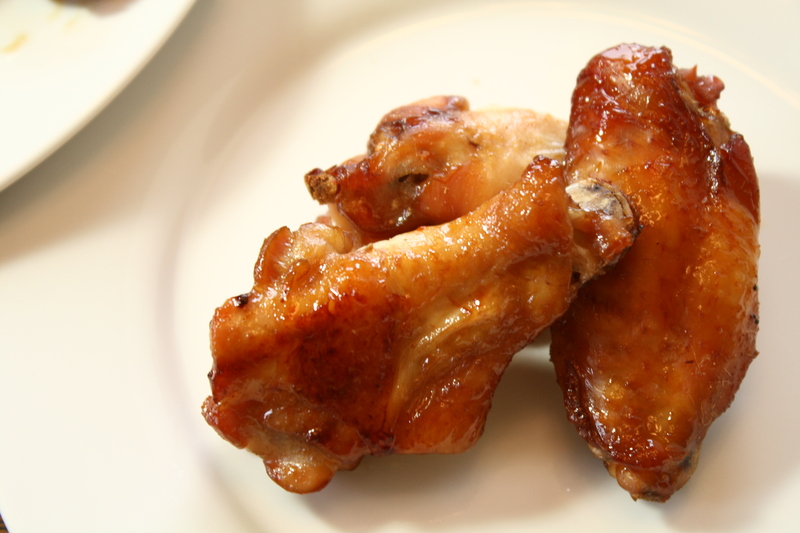 The recipe for today is one that I got online. 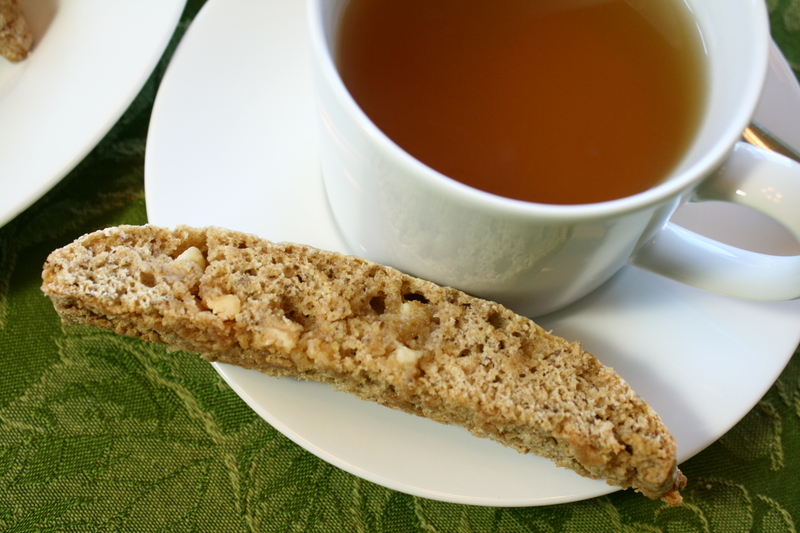 I was searching for a low fat biscotti and I found it on the Angry Chicken blog here. It’s become a favorite in our house and I’ve made it my goal to try every possible combination of flavors imaginable. I don’t have a recipe card for this so I’ll type it out for you. You can add 1/4 to 1 teaspoon of spices (depending on your taste) or a half cup of baking chips. 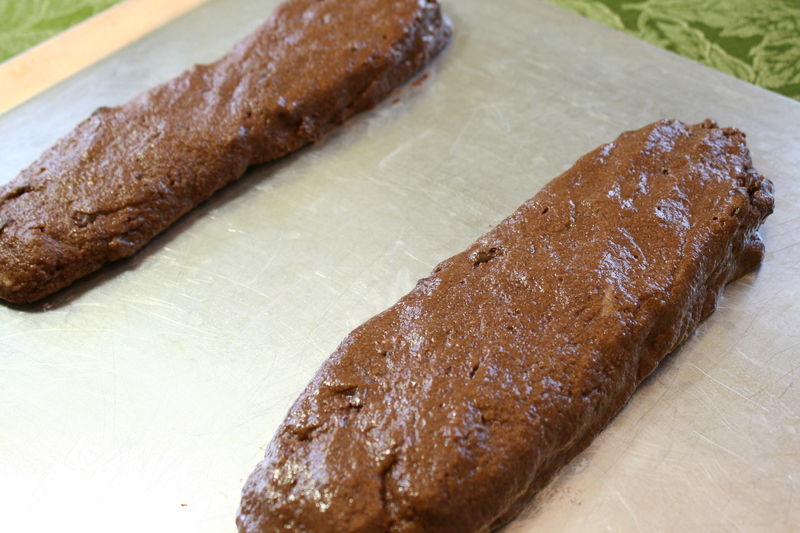 For chocolate dough, I usually add 1/4 cup unsweetened cocoa powder and decrease flour by 1/4 cup. Make 2 logs and flatten them a bit. They should be about 3 inches wide by about 10 inches long. Let cool about 15 minutes. Lower oven temperature to 325 degrees. Cut logs into 1/2 inch slices (a serrated knife and a light hand are crucial). Put back on baking sheet and bake about 15 minutes more, flipping them halfway through. We’ve tried almost all of these variations and love them all. 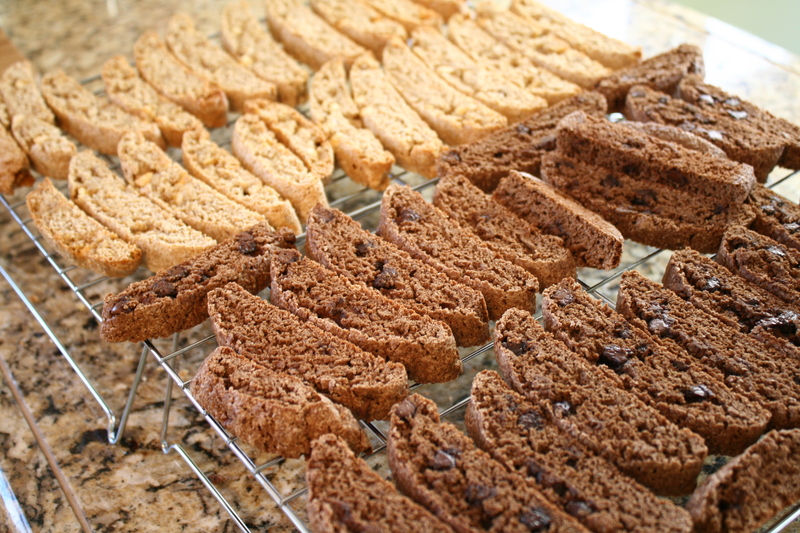 I usually make two kinds of biscotti at a time. This time I made white chocolate cardamom and chocolate chocolate chip. I usually don’t let them get too hard – you don’t have to always dunk them that way. I also tried a new kind of tea – Good Earth Matcha Maker. 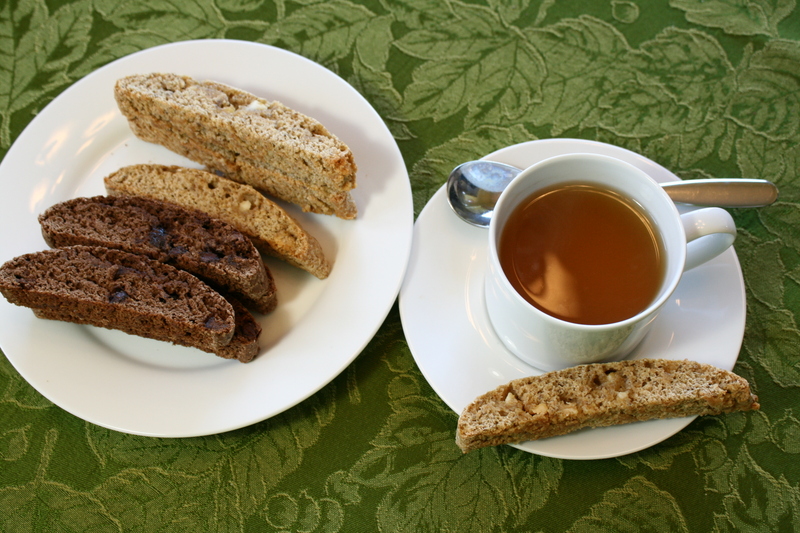 These biscotti are just right for coffee or tea. 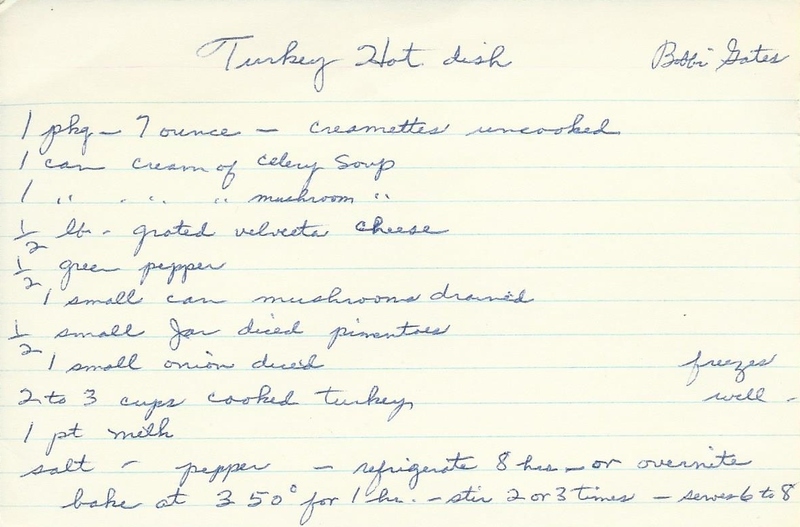 The recipe I’m sharing today is one that originally came from my mom. 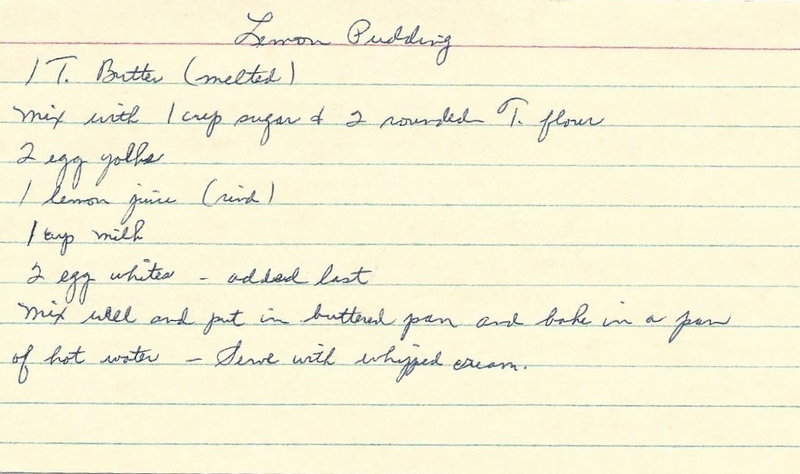 I used to make this quite often and I was surprised to see it in Grandma’s recipes, too. We had our oldest daughter staying over for the weekend so we had a Sunday morning brunch. This Coffee Cake was a part of our brunch. It’s another one with the “V Good” connotation! 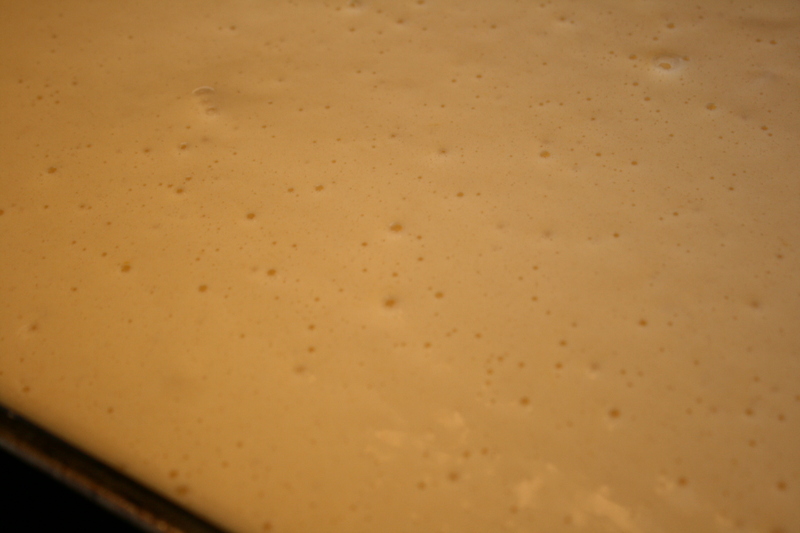 Spread in 9″ x 13″ cake pan that’s been sprayed with non stick spray. 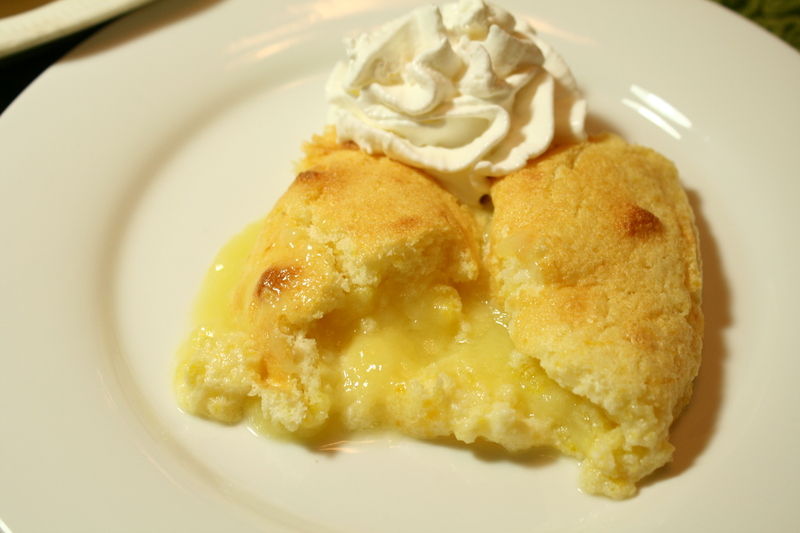 The melted butter topping almost looks like a caramel on the top of the batter. 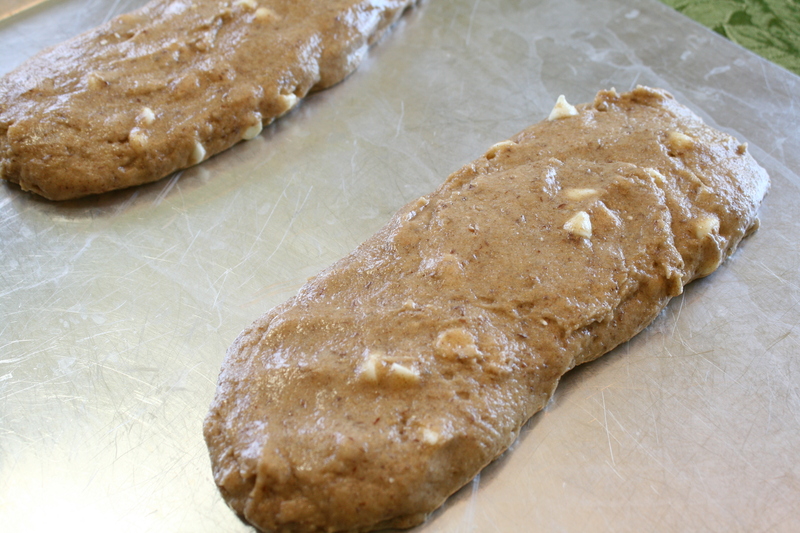 This is the batter before baking and then after. 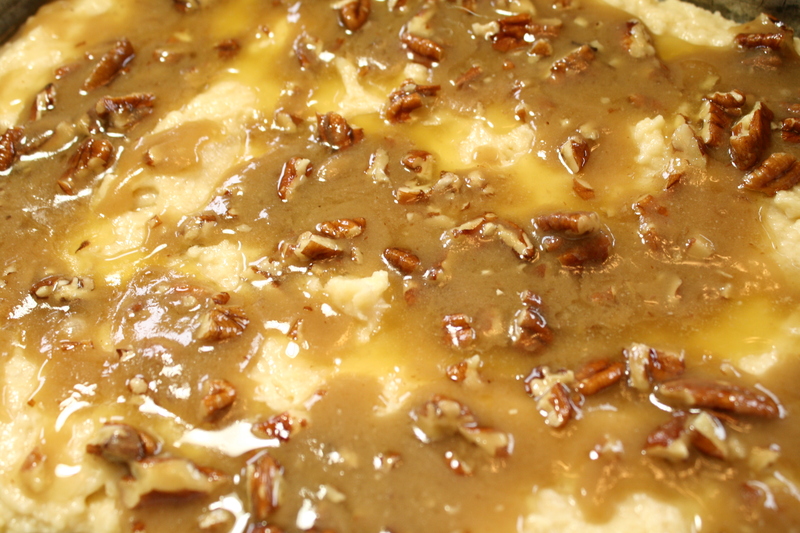 The topping sinks into the batter and makes a caramel-ly crust. 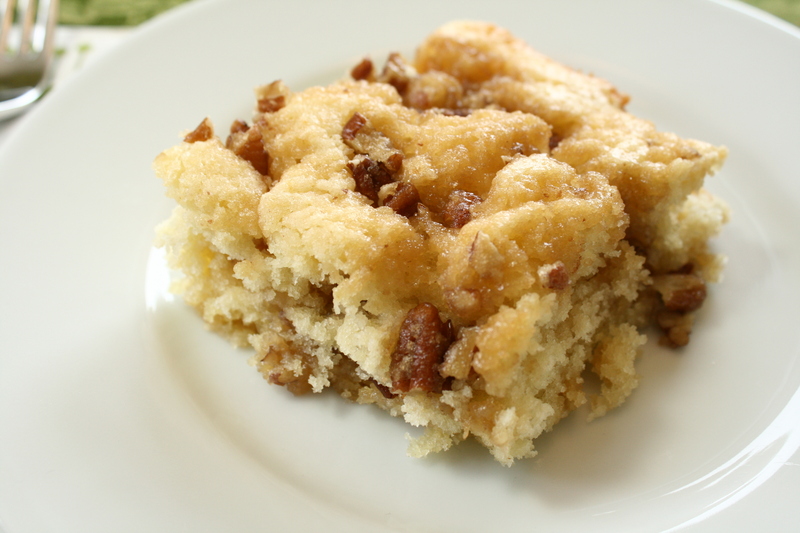 Coffee Cake is great for breakfast or brunch. It’s also great with coffee or tea. 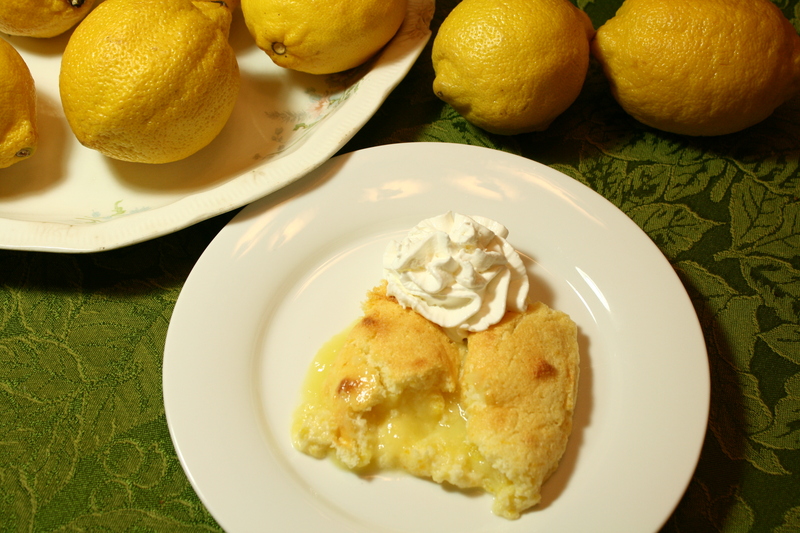 Lemon Pudding is something I could make for the lemon lovers in my family. 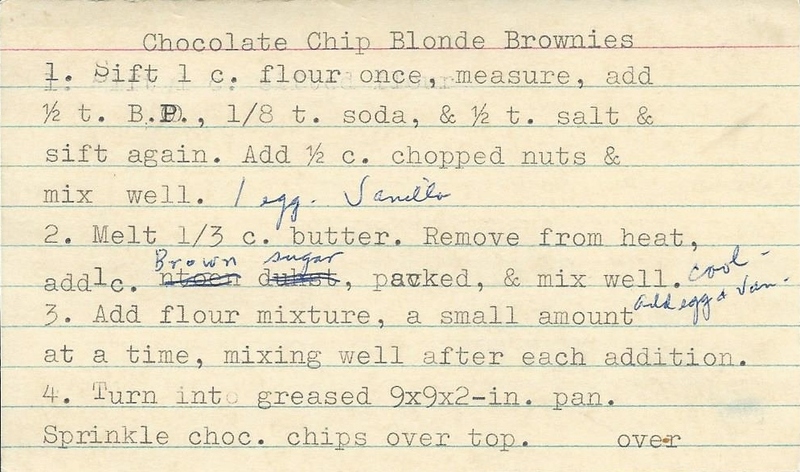 It all looked easy enough when I started reading the recipe – and then I got to the end. No size recommendation for the pan to bake it in. No temperature at which to bake it. No time as to how long to bake it. Grandma, sometimes . . . I know, I know, I should know this stuff. Well – I learned a couple of things when I made this one. Beat egg whites and set aside. Mix well and put in buttered 8″ x 8″ pan. 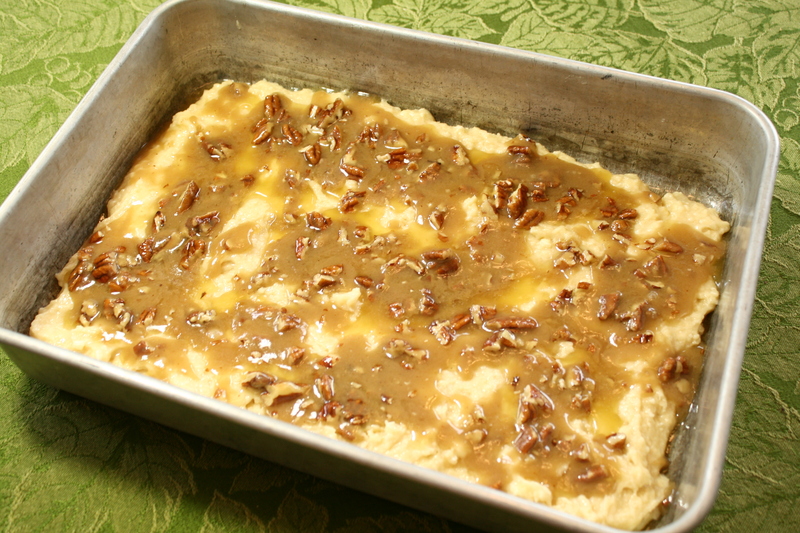 Put the 8″ x 8″ pan into a 9″ x 13″ cake pan and fill with hot water until the water is halfway up the smaller pan. I used a 7″ x 11″ pan and it was too big so the pudding got a bit thin top to bottom. That’s why I would use a 8″ x 8″ pan next time. That was one thing I learned. I also learned not to tip the water out until I’ve taken the pudding out of the hot water bath. 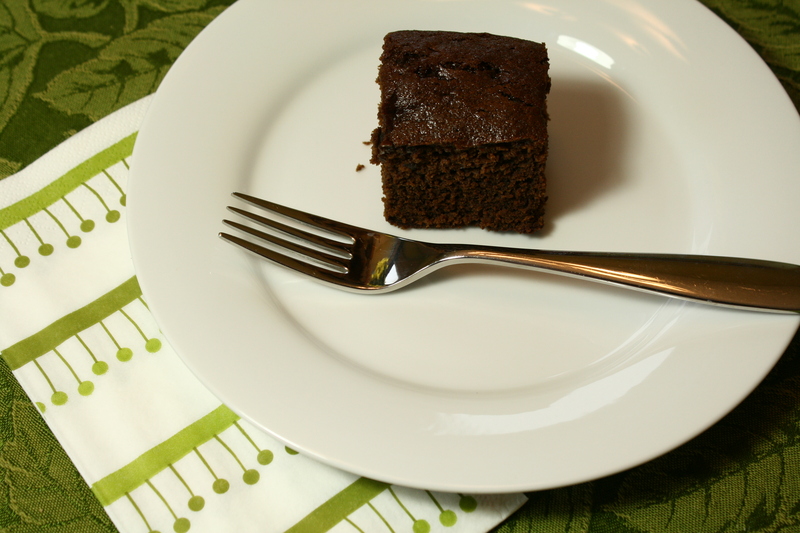 That’s another reason to use the smaller baking pan – you can get a grip on it to get it out of the cake pan easier. It was cakey on top and had a nice creamy pudding on the bottom. With the cold weather we’ve been having this winter in Minnesota, this was a nice breath of spring. I could imagine that we were in Florida. 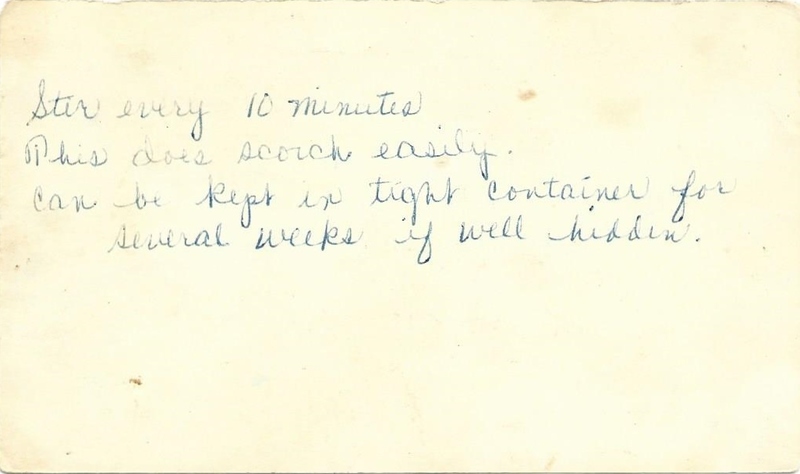 Today’s recipe comes from my mom. 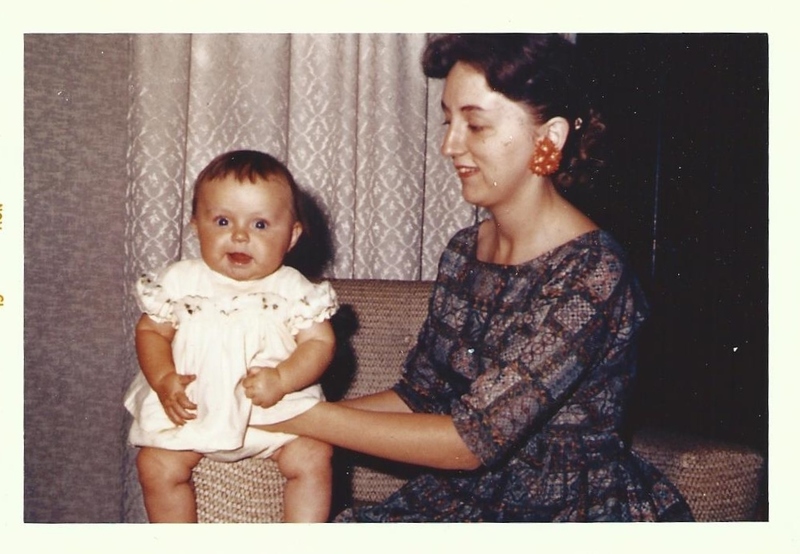 This picture is one of the thousands of me and mom in the early days. I’m sure there were so many pictures taken so they could be sent to my dad who was in the Army and stationed in Turkey at the time. I was almost 2 years old when he came home to stay. I know a couple of granddaughters who would love to have those earrings! 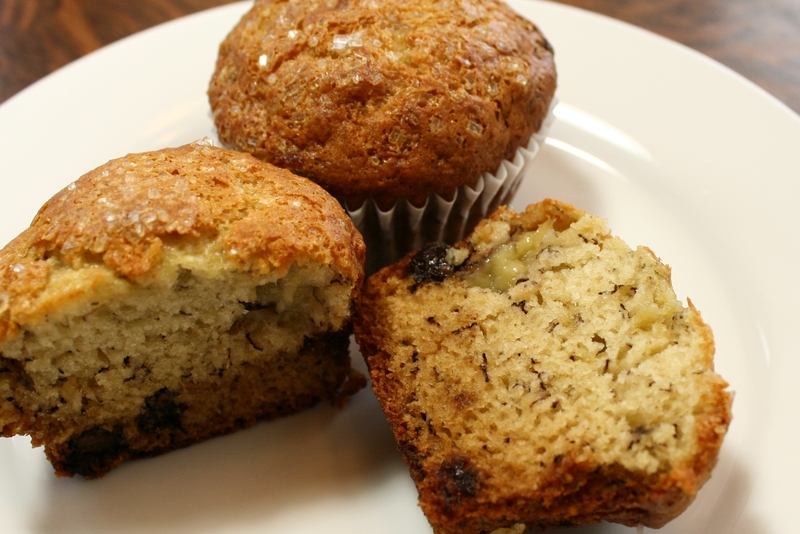 I would rather have these Banana Muffins than banana bread. 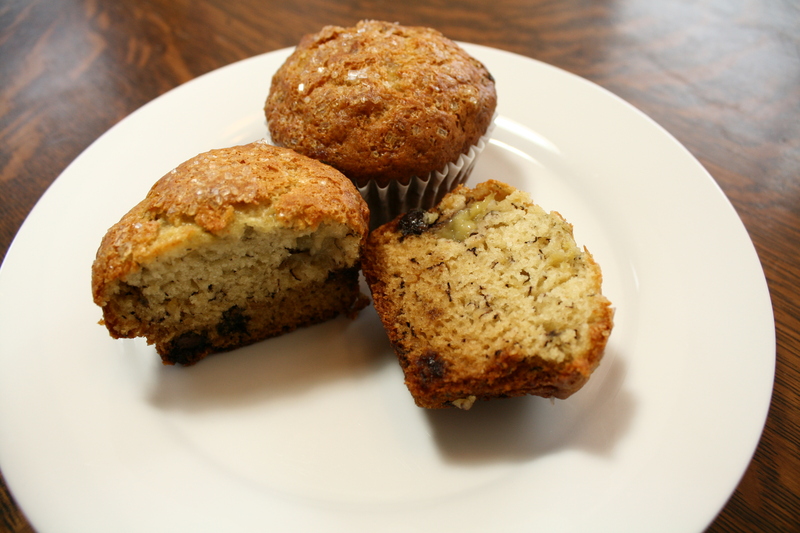 My mom used to make great banana bread, but these muffins are just the best. 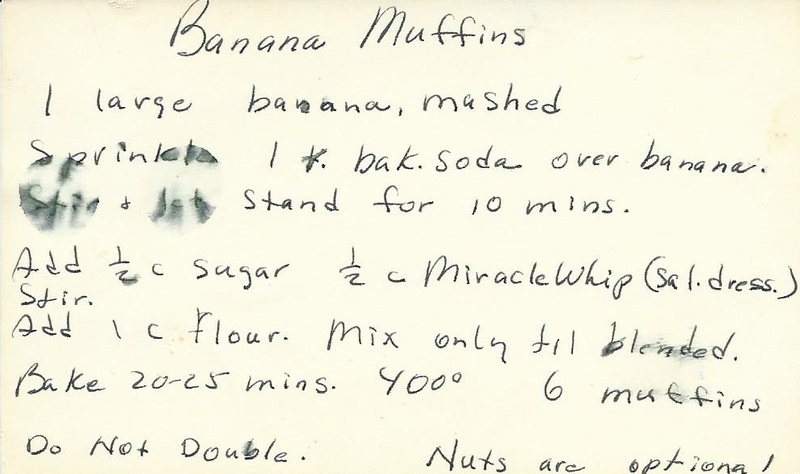 Everyone always asks for this recipe once they’re tasted the muffins. 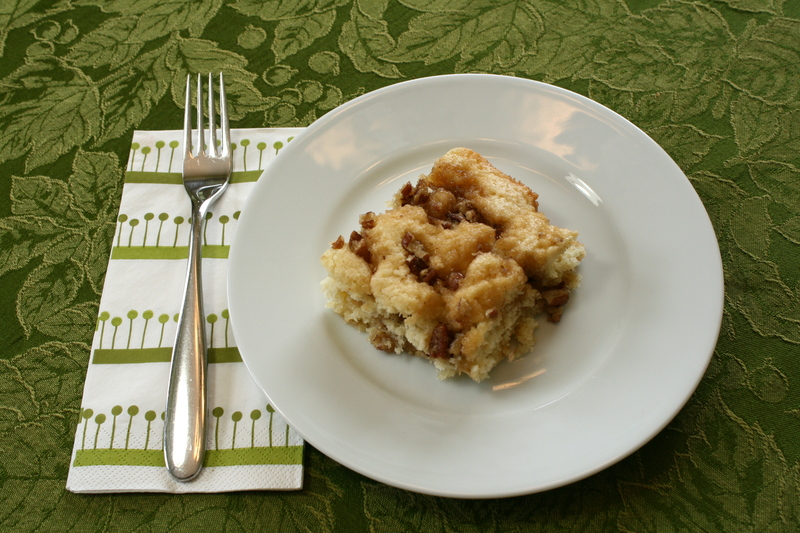 This is a great way to use up your over ripe bananas. Sprinkle 1 teaspoon baking soda over banana. Stir and let stand 10 minutes. Add 1/2 cup sugar and 1/2 cup Miracle Whip (salad dressing). 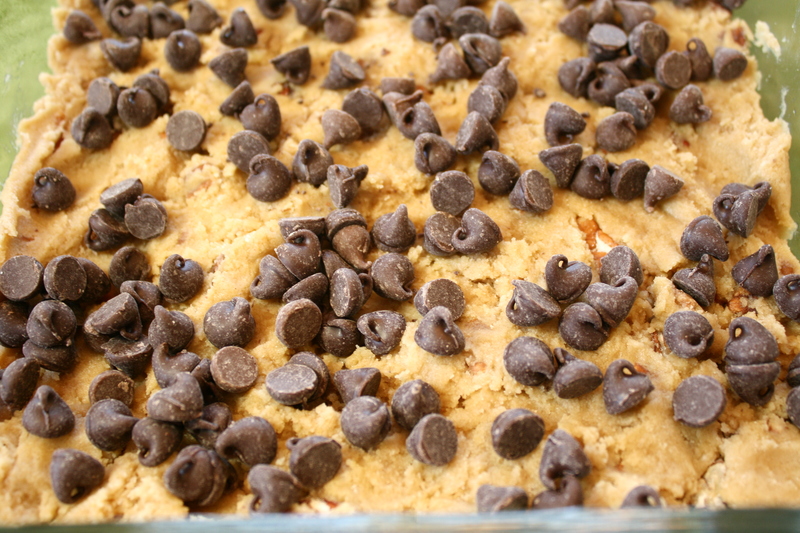 I also add about 1/2 cup chocolate chips. Add 1 cup all purpose flour. I also sprinkle a little sugar on top before baking (I use larger grained sanding sugar used for decorating cakes or cookies – you can find it here). The recipe says nuts are optional – so are the chocolate chips. 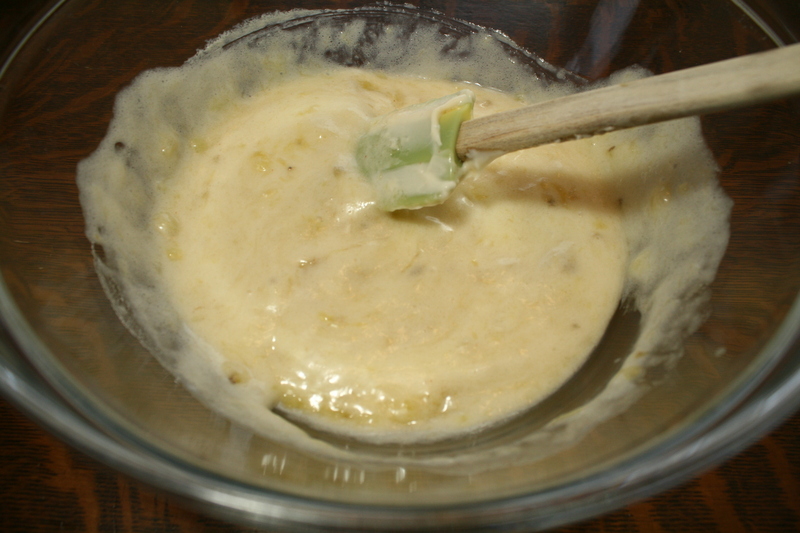 This is how the mixture foams up when adding the banana/baking soda mixture to the sugar and Miracle Whip. 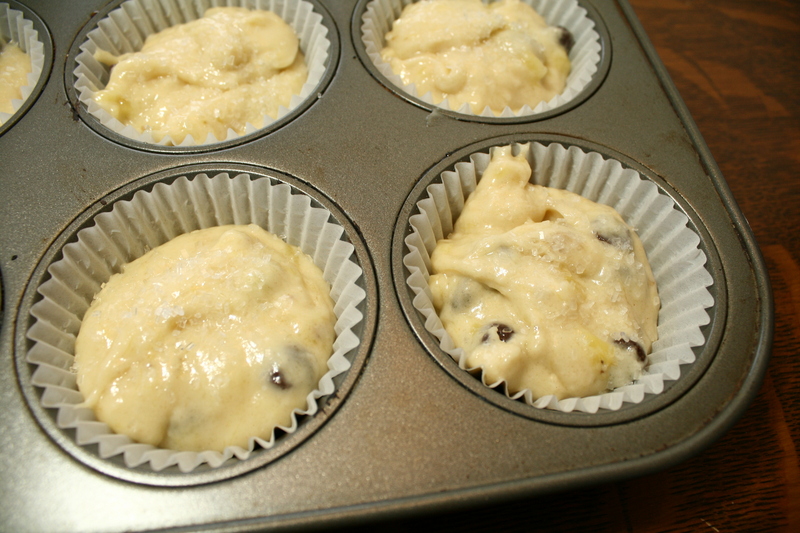 You can see the chocolate chips in the batter and you can kind of see the sanding sugar on top here. 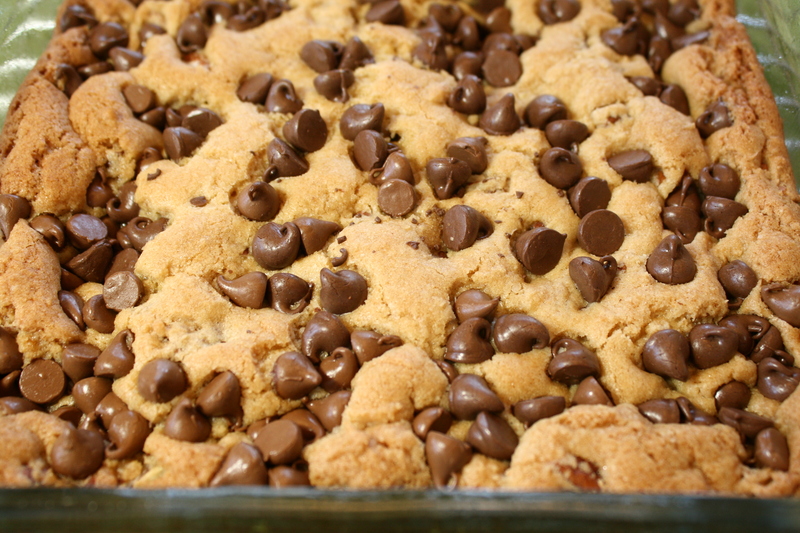 These are so delicious right out of the oven with the melty chocolate chips. 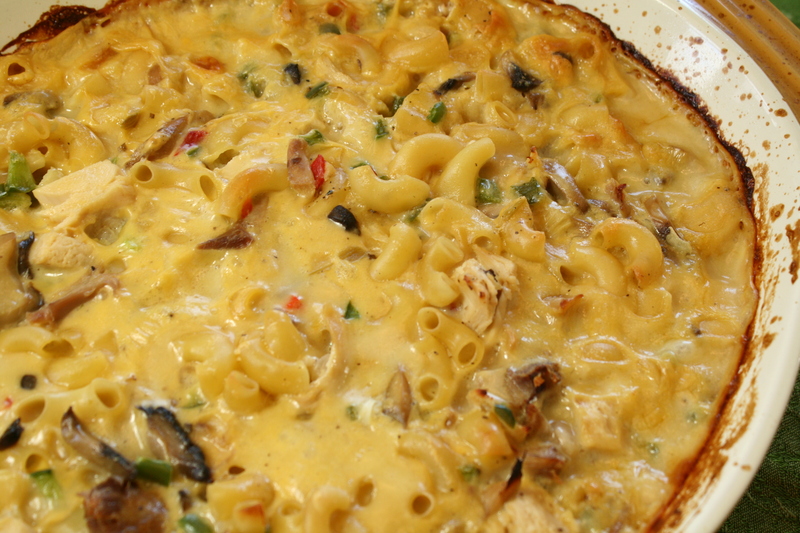 Today’s recipe is another one of those really quick, really tasty ones. 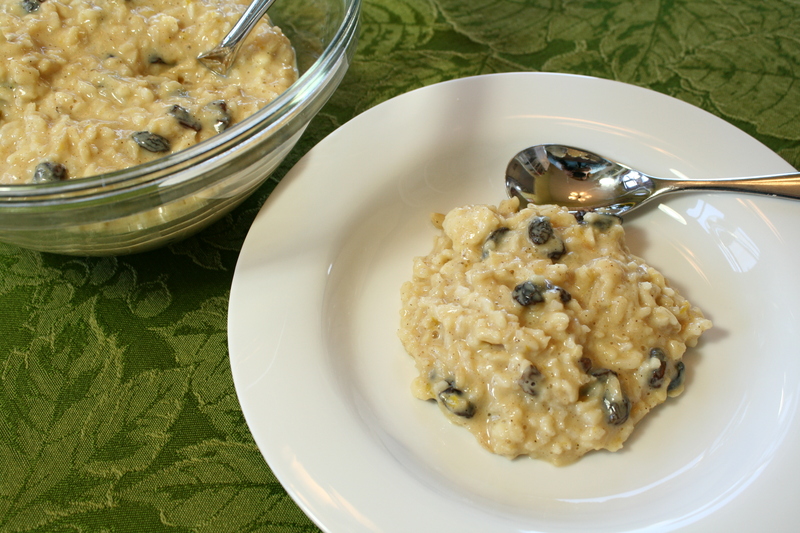 Creamy Rice Pudding is made even simpler by cooking the rice ahead of time. I cook my rice according to the package directions, put it in 1 cup measurements in a freezer bag, and then freeze it for later use. I do this for white rice, brown rice, and wild rice. It’s a big time saver – all ready to go. 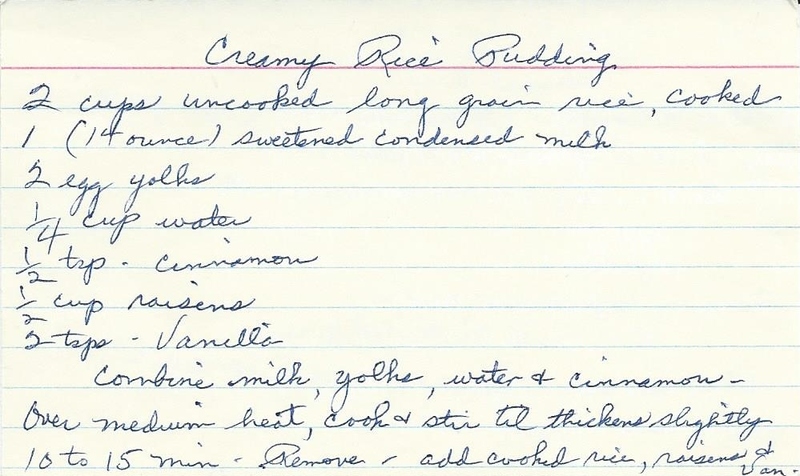 This recipe also reminds me of the rice Grandma used to make when I was a child. She used whole milk instead of water to cook the rice and then served it with cinnamon and sugar on top. 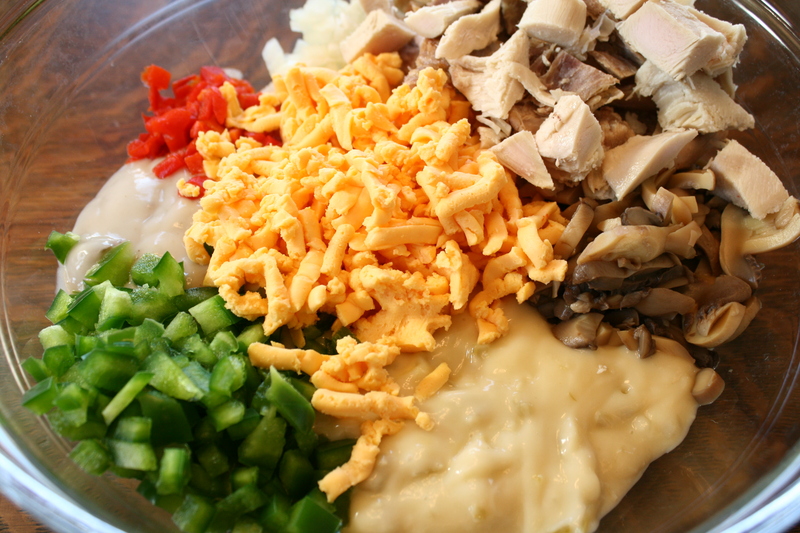 It’s done when the rice is cooked and creamy. The aroma of that rice cooking is a BIG childhood memory for me. I never can make it so it’s just like Grandma’s. You get another bonus recipe on the back of this card! Combine milk, egg yolks, water and cinnamon. Over medium heat, cook and stir until it thickens slightly, 10 to 15 minutes. 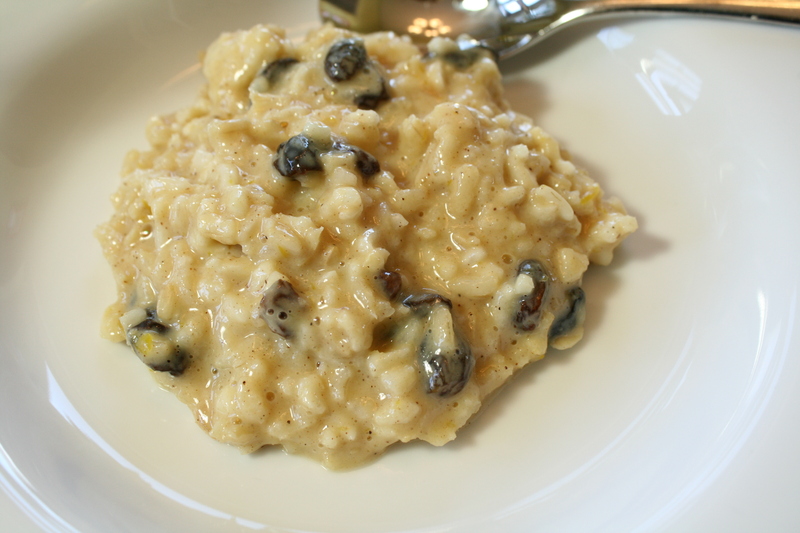 Remove and add cooked rice, raisins and vanilla. Cool. Refrigerate leftovers. 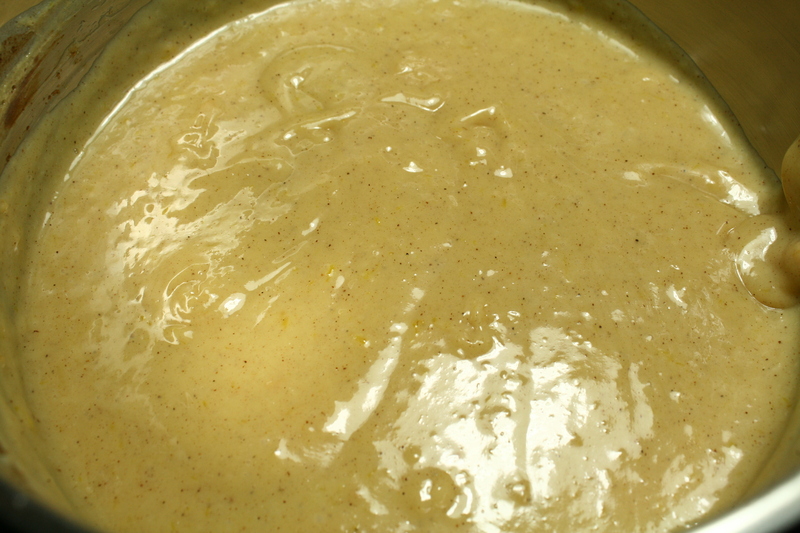 You can see how it changes from before cooking to after and turns thicker and more blended. 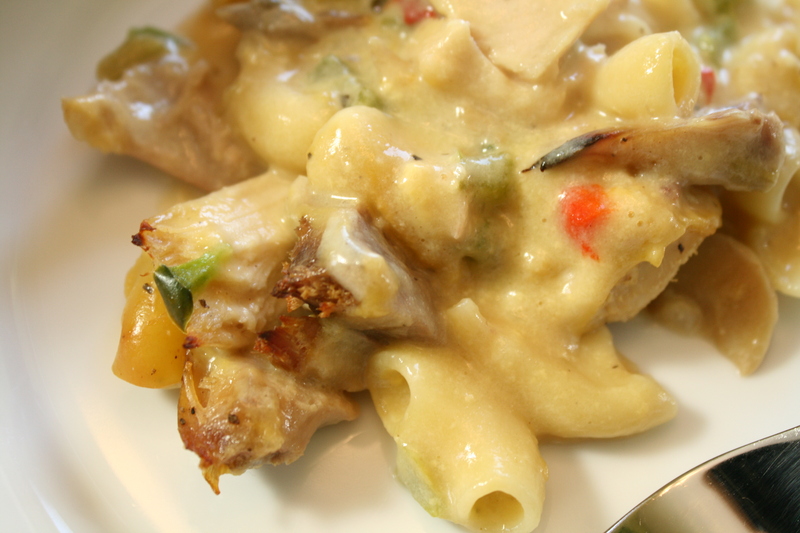 This is another great comfort food dish. 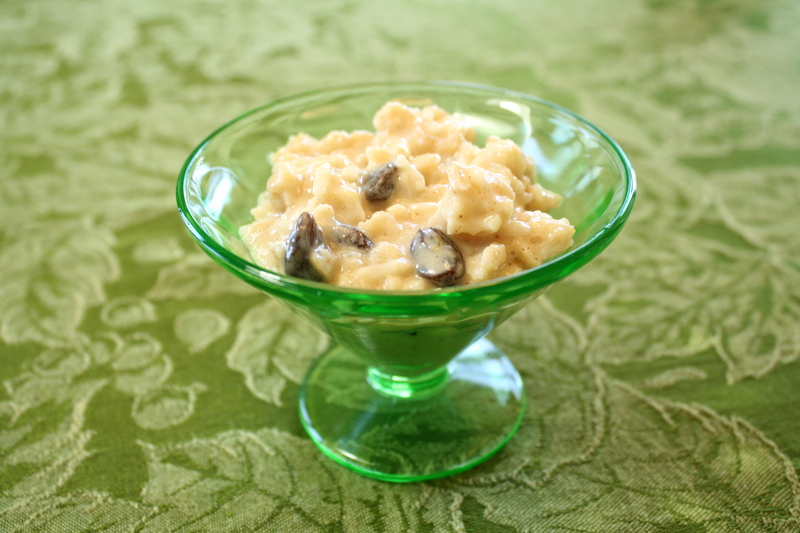 Warm and creamy and sweet – a special treat. It’s nice enough to put in a pretty dish and have for a fancy dessert. So quick and so easy and so good and so comforting. 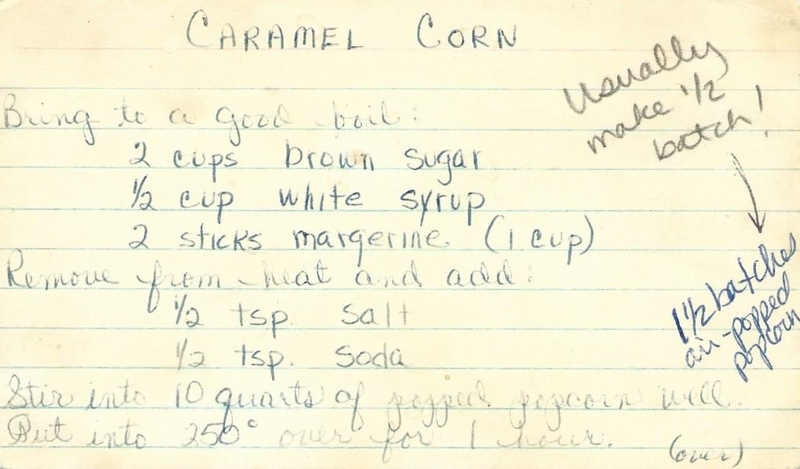 I was looking through my stack of Grandma’s recipes the other day, thinking about how many of them I have, and I realized that I don’t even have them all. I’m not sure why, but some of them are gone. She may have pared them down when she got to the point of not entertaining so much any more. They entertained as many as 12-15 people at a time until they moved into an assisted living building when they hit their mid 80’s. 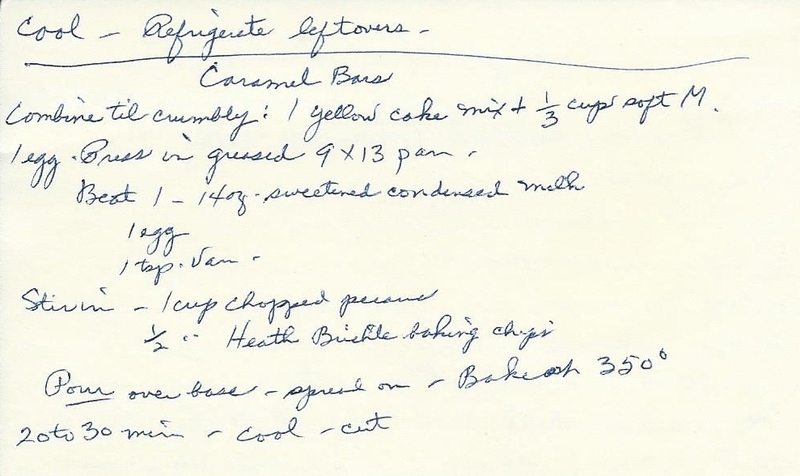 I would love to have had ALL of those recipes. On the farm, Grandma had a flour bin in her kitchen big enough to hold about 25 pounds of flour. It wasn’t a huge kitchen, but there was a flour bin built right in as part of her kitchen cupboards. I’m sure that was because when they were first married, she made all of their bread for the week. It took a lot of flour and it was a lot of work. If someone ate them all right away – then you wouldn’t have any more until the next baking day! 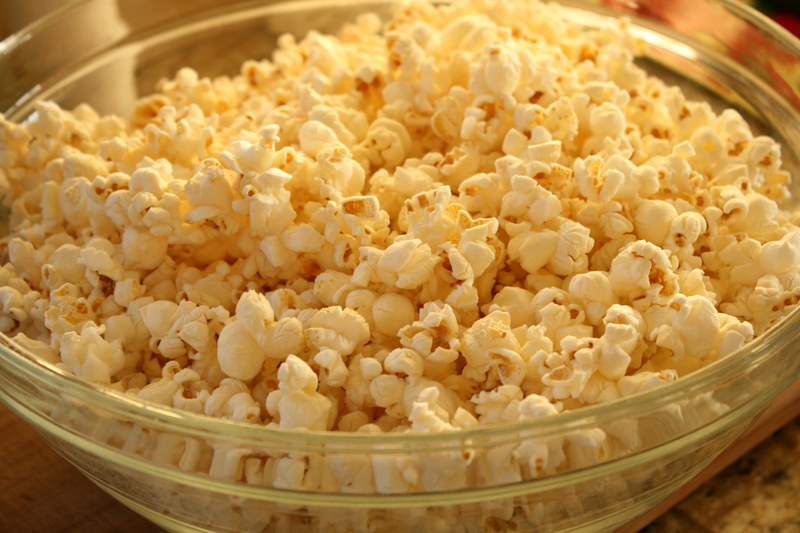 No wonder a lot of these recipes use convenience items and take very little time to prepare. 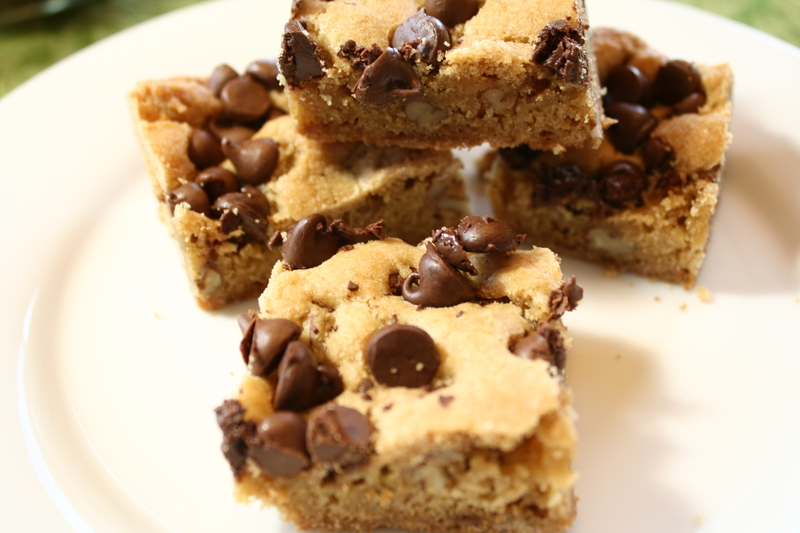 Chocolate Chip Blonde Brownies is quick recipe that makes a smaller batch just right for a treat. 1. Sift together one cup all purpose flour, 1/2 teaspoon baking powder, 1/8 teaspoon baking soda and 1/2 teaspoon salt. Add 1/2 cup chopped nuts (I used pecans) and mix well. 2. Melt 1/3 cup butter. 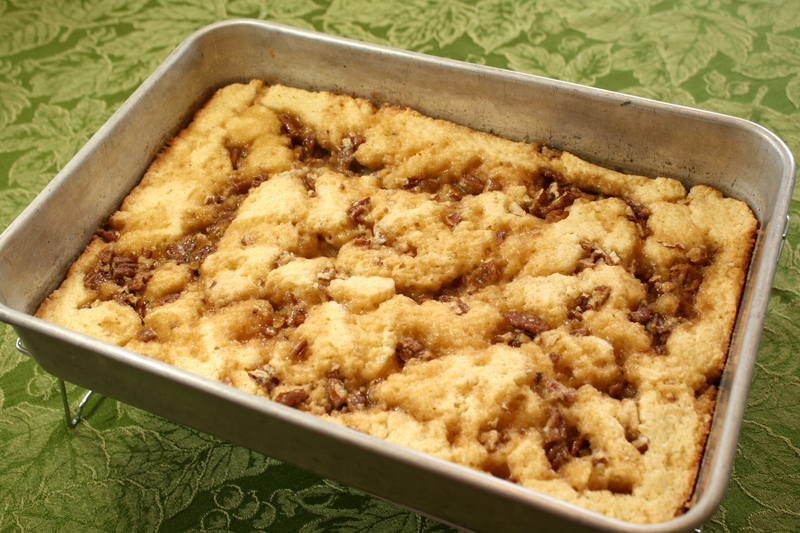 Remove from heat and add 1 cup packed brown sugar and mix well. Cool and add 1 egg and 1 teaspoon vanilla. 3. Add flour mixture, a small amount at a time, mixing well after each addition. 4. 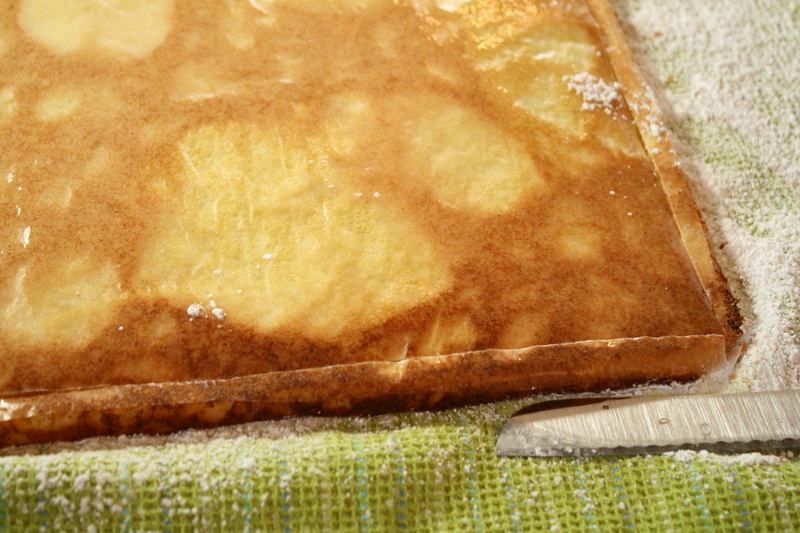 Turn into greased 9″ x 9″ baking pan (I only have an 8″ x 8″ pan so that’s what I used). Sprinkle 1/2 cup chocolate chips over top. 5. Bake in 350 degree oven for 20 to 25 minutes. Cool in pan. The batter is thick and you need to spread it over the pan. Chocolate chips hold their shape but you could spread the melted chips over the top of the bars if you really wanted to. 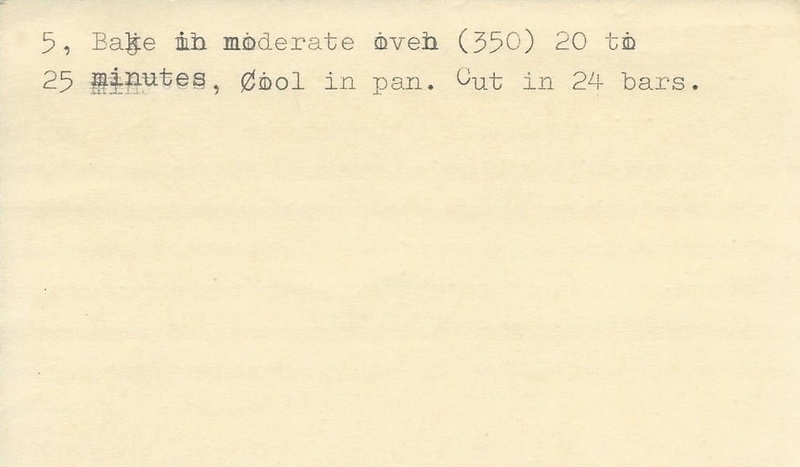 This recipe said to use a 9″ x 9″ pan and to cut it into 24 squares. I used an 8″ x 8″ pan and got 16 squares out of it. 24 seemed like they would just be too small. Ha. 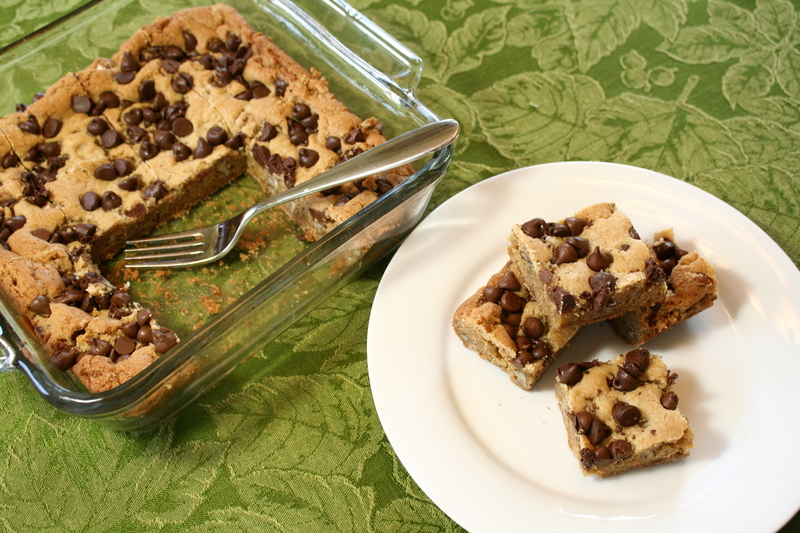 These blonde brownies didn’t take much flour but they are a quick and wonderful treat! 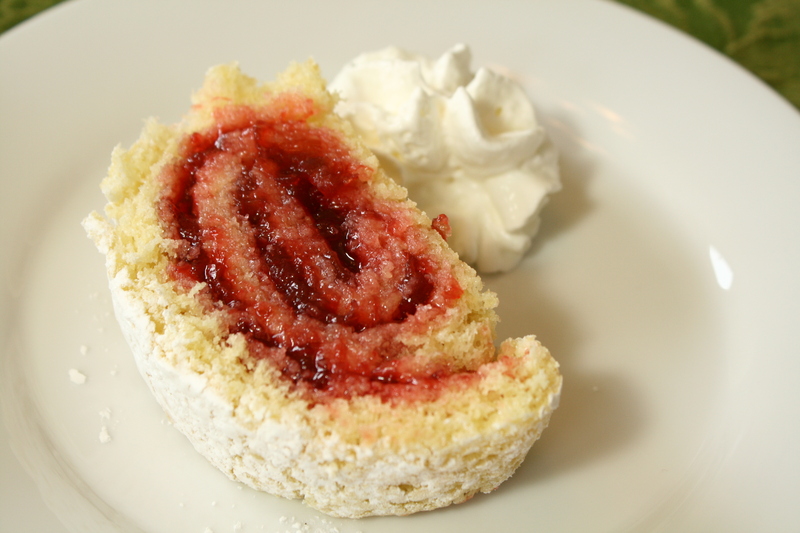 This Old Fashioned Jelly Roll recipe seems pretty straightforward, but this was my first time. 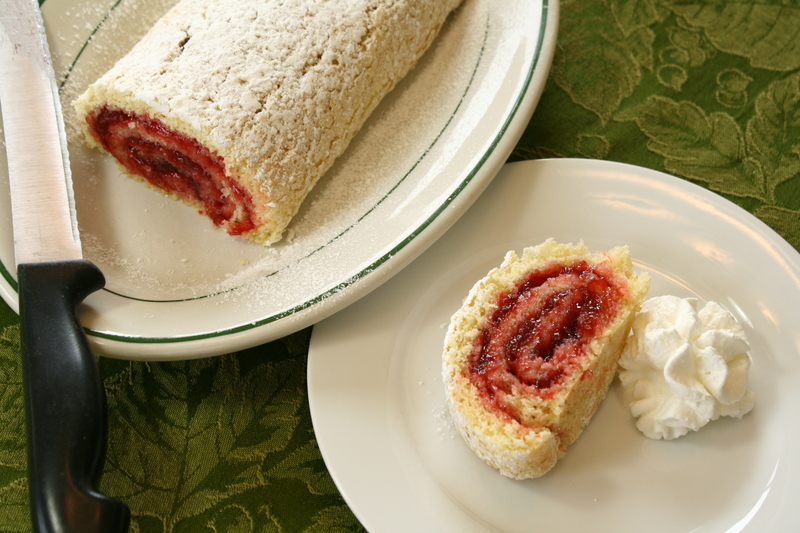 I’ve never done a jelly roll before so I was doing some questioning out loud – to myself – when my husband chimed in about technique. He was a baker in his younger days and he had some tips about how to do it. Normally I don’t allow his bakery techniques into my home kitchen, but I needed some advice. It is a bit complicated so . . . here we go. 1/4 cup cold water and 1 teaspoon vanilla. Stir until smooth. 3/4 cup sifted all purpose flour, 2 teaspoon baking powder, 1/2 teaspoon salt. 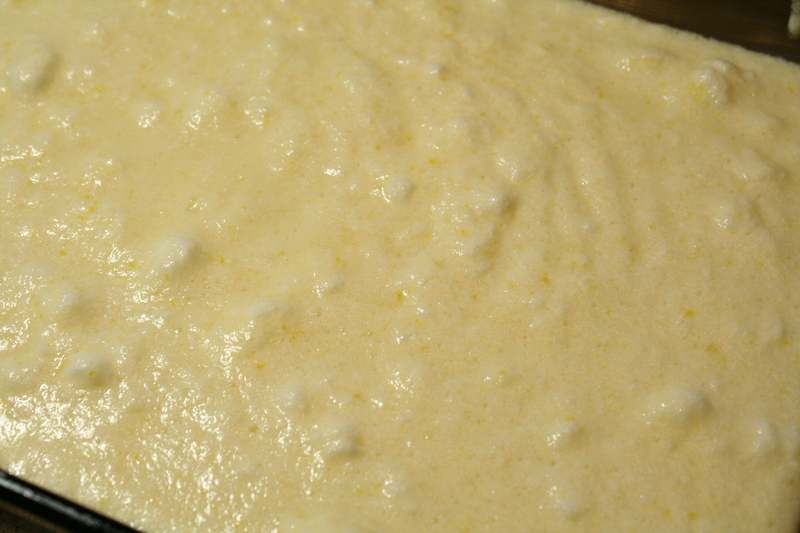 Add gradually to egg mixture. 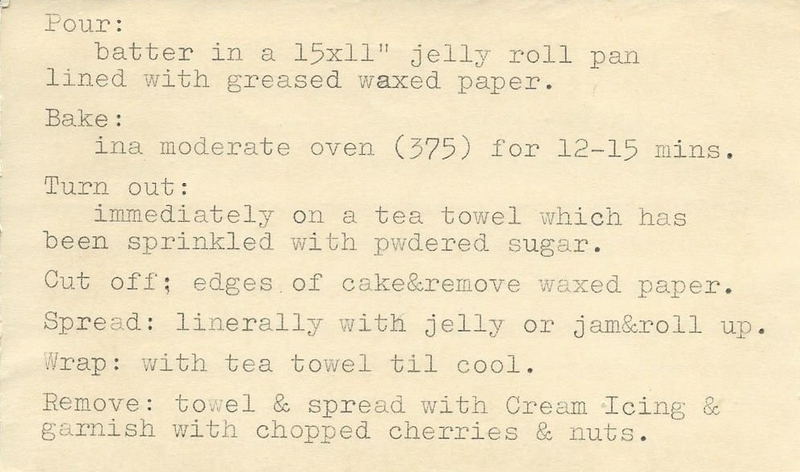 batter in a 15″ x 11″ jelly roll pan lined with buttered waxed paper (although I think parchment paper would be easier to remove later). in a 375 degree oven for 12-15 minutes. 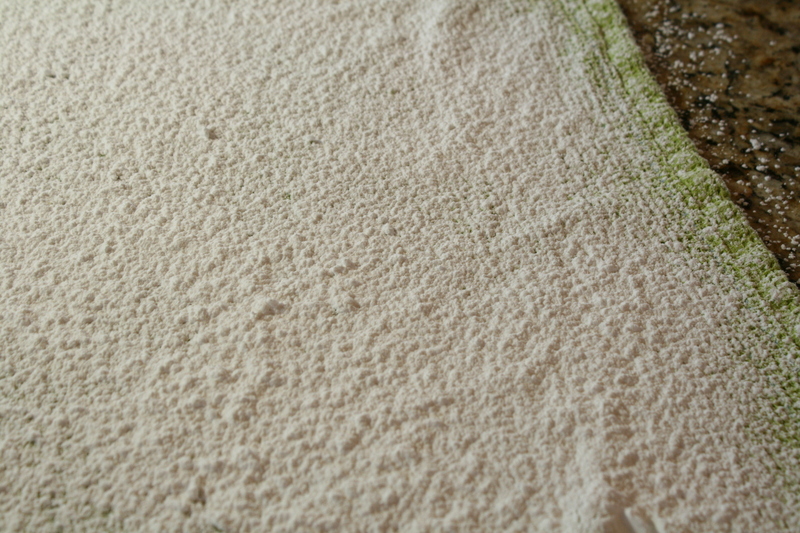 immediately onto a tea towel which has been sprinkled with powdered sugar. edges of cake and remove waxed paper. liberally with jelly or jam and roll up. with tea towel until cool. tea towel and spread with icing or sprinkle with powdered sugar. The cake is light and airy. Parchment paper might be better next time under the batter (the waxed paper stuck and took off half of the cake), although parchment might be tougher to cut off. I used a sieve to sprinkle the powdered sugar over the tea towel. The jam I used is a homemade strawberry-rhubarb (which we’ll explore again this spring when my rhubarb sprouts and I make another batch of jam). 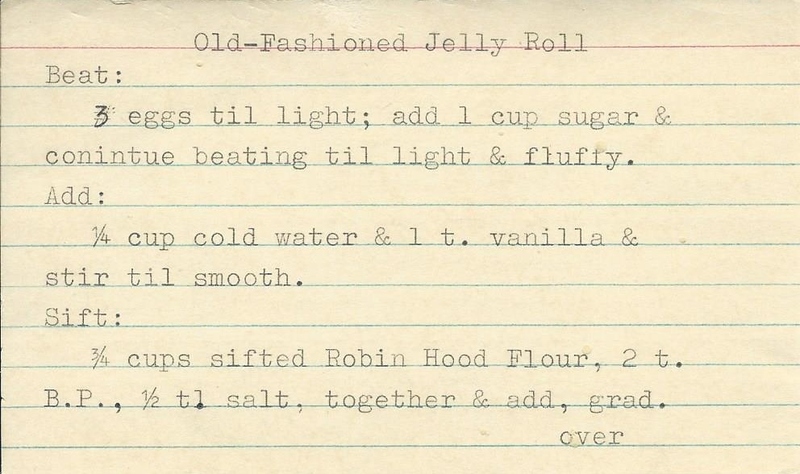 This jam is a bit chunky so it seemed like I needed to use a lot of it – if using a jelly, you might need to put less on. This is nice and light and would be great with coffee or tea. Isn’t everything enhanced by a little whipped cream? 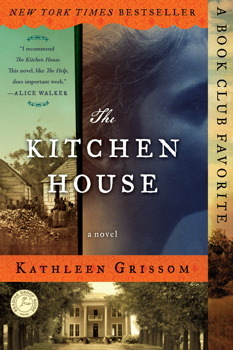 The book club I’m in met at my house this month to discuss the Kathleen Grissom novel, The Kitchen House. You can read about the book and purchase it here. Our book club loved the book – there’s a lot to discuss in there! I especially like the way she wrote from both the perspective of the white indentured servant girl and the black slave girl. Just as interesting to me was how she came to write the novel in the first place and where the inspiration for it came from. You’ll have to read The Kitchen House to find out more!! 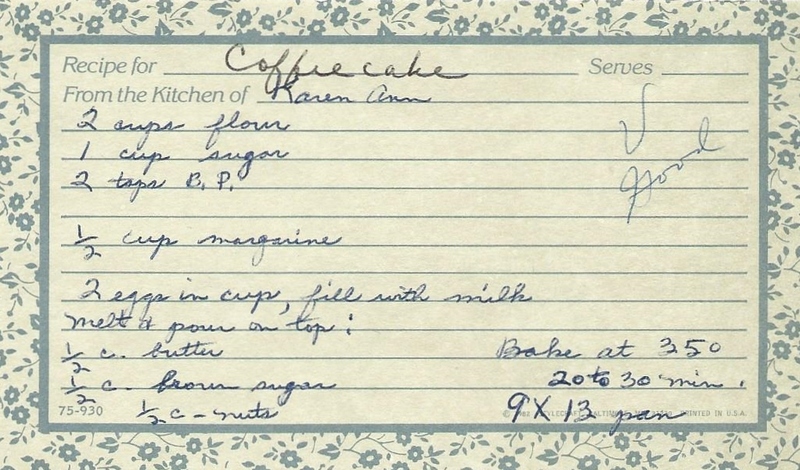 One of the members of our book club had seen where Kathleen Grissom gave an interview in the back of the book and told about she and her daughter creating a recipe for Simple Molasses Cake – close to something that was described as having been made in the kitchen house on the plantation in the book. Her suggestion was that I should make it for book club – “just sayin”. . .
Preheat the oven to 350 degrees. Grease an 8-inchsquare baking pan. In a large bowl, cream the butter and sugar. Beat in the egg. 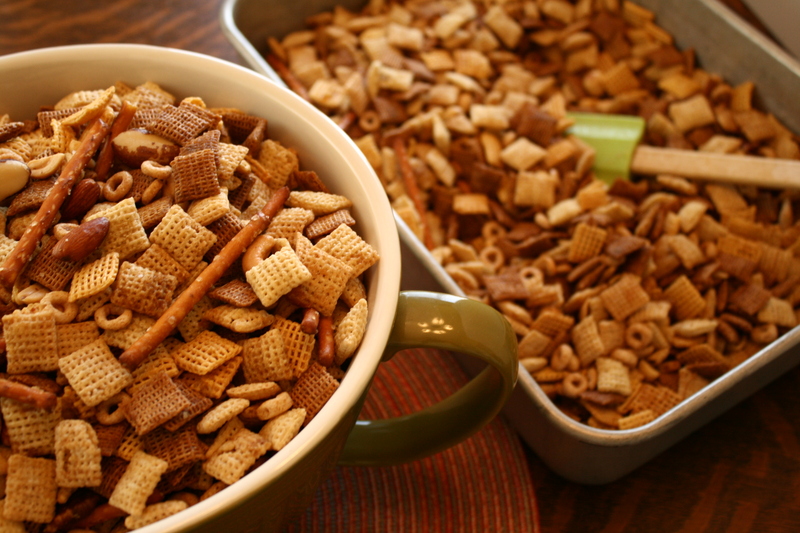 In a separate bowl, combine the milk and the molasses. In another bowl, combine the flour, baking soda, ginger, cinnamon, cloves, and salt. 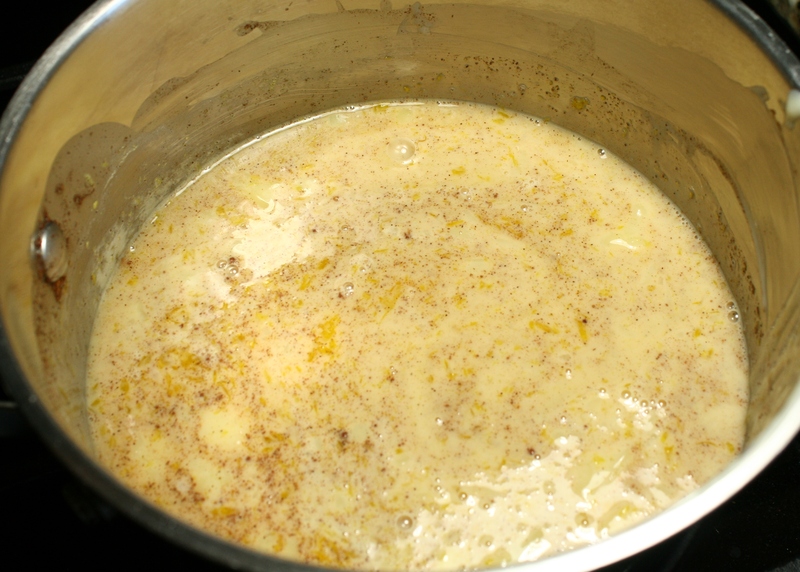 Add each of these alternately to the butter mixture, beating well between additions. Spoon batter into the prepared pan. Bake for approximately 45 minutes, or until a toothpick comes out clean. 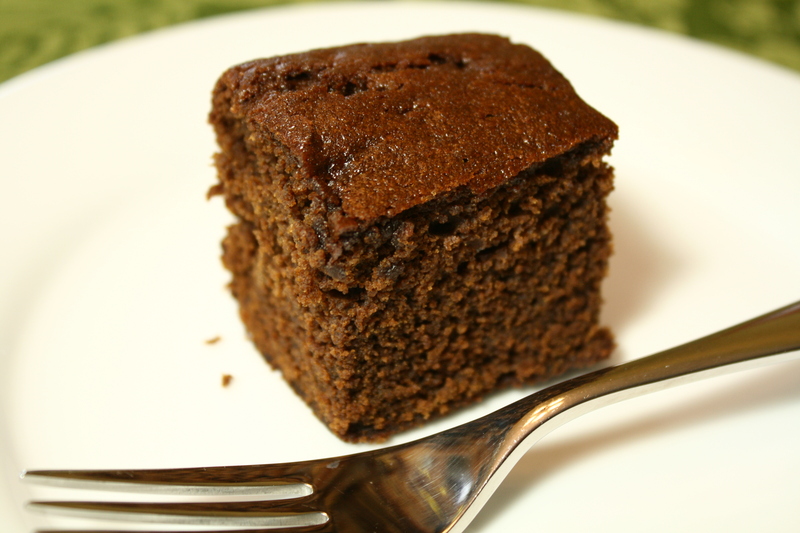 It was dark and spicy like a gingerbread cake. My kitchen (house) smelled amazing while this was baking. It’s a very moist and delicious cake. What recipes or foods have you tried after being inspired by stories or books? 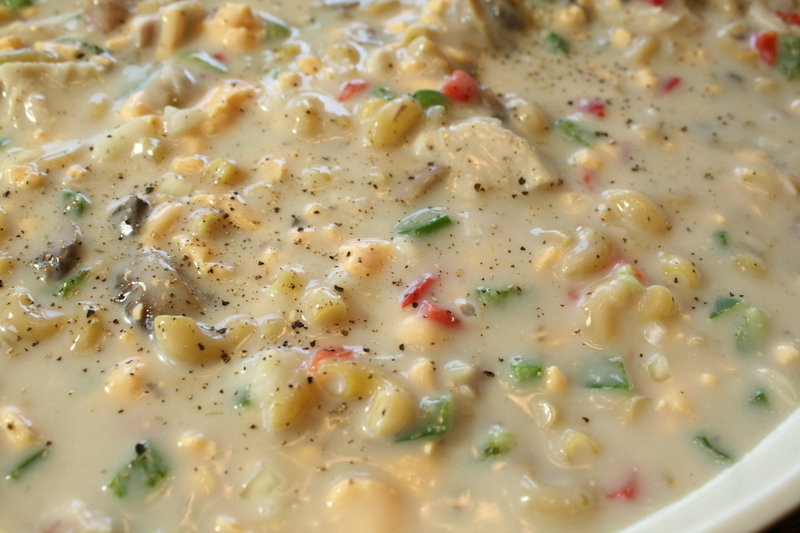 We’re continuing with things that bring me warmth during the deep freeze and hot dish always does it. 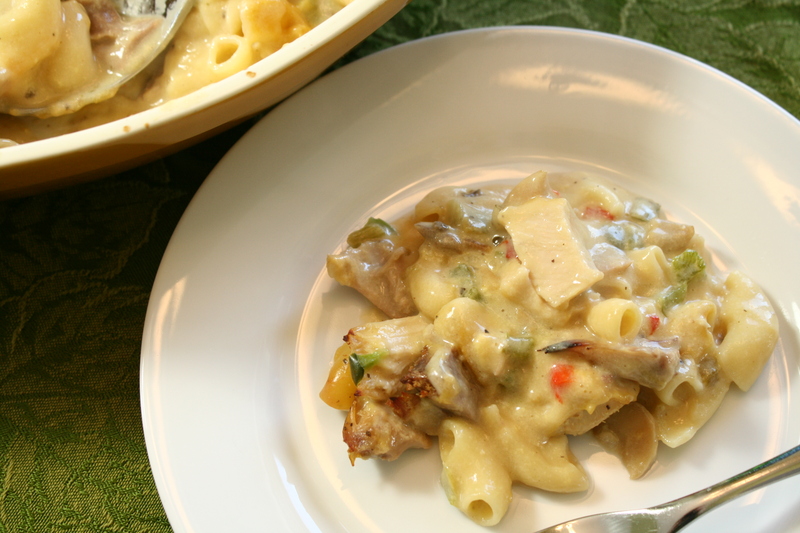 Turkey Hotdish is another one that you’re able to do the night before and have ready when you need it the next day. It’s ready after work, it’s ready for weekend guests, it’s ready when you just want to be able to have it ready to go. This is definitely one from the 70s. Bake at 350 degrees for an hour or so, stirring 2 or 3 times during baking. I found that grating the Velveeta was easier when you put it in the freezer for a bit before trying it. You can see the difference from when I mixed it up to the next day just before putting it into the oven. 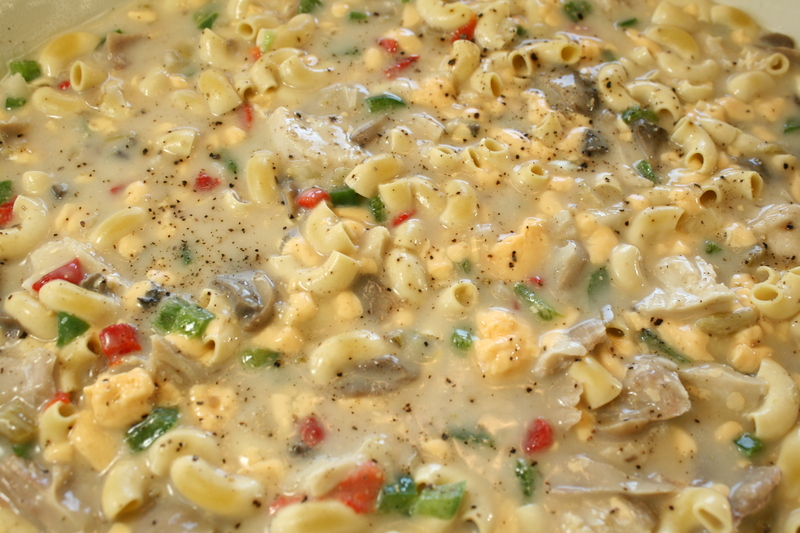 The pasta had soaked up some of the liquid and softened up. Hot and bubbly out of the oven! I used some leftover turkey from Thanksgiving to make this. My husband declared this the best hotdish he’s ever eaten! What have you been doing to keep warm during this cold snap?